The Cape Neddick Light Station, also known as Nubble Light, underwent major renovations over the summer. 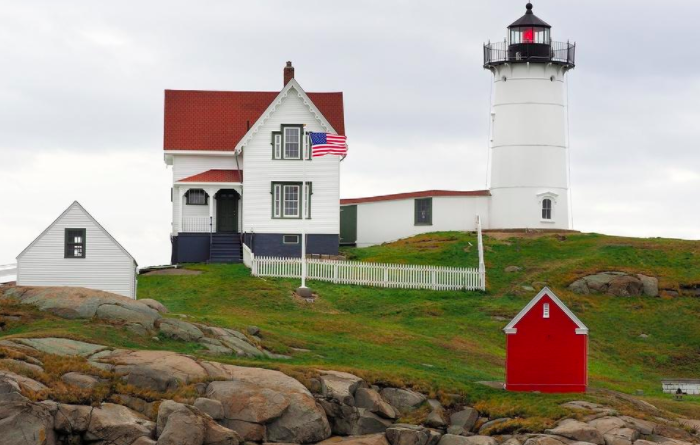 YORK, Maine — The Cape Neddick Light Station will be strutting its stuff during this year’s Lighting of the Nubble, with a new, clean and sparkling look following a major renovation of the lighthouse keeper’s house and the light tower. It is the first time in many years that the buildings on the island have undergone a thorough restoration, including the main building, as well as the workshop and utility building. Visitors last summer and this fall would have noticed the scaffolding that was erected as each section of the house, outbuildings and light tower was brought back to life. In fact, work just wrapped up last week, several weeks later than anticipated, said Jim Leslie of JB Leslie Co., which specializes in lighthouse restoration. The work was undertaken after Groundroot Preservation Group of York conducted an exterior condition assessment in 2017 and found widespread problems associated with buildings in an extreme marine environment. At the same time, the Cape Neddick Light Station is on the National Register of Historic Places, so all work has to be approved by the Maine Historic Preservation Commission. JB Leslie was hired by the town last February, and has since been awarded contracts totaling $238,000 for two phases of work. Phase 1 involved exterior work to the keeper’s house, the connector building to the lighthouse, the red generator building and the small white keeper’s workshop. During Phase 2, Leslie and his crew removed all the paint from the cast iron tower itself, repainted it, as well as repaired or replaced the railing around the light itself. All costs for this and future work are paid for through Sohier Park gift shop revenue; no taxpayer funds are used. The lighthouse work was interesting, said Leslie. First of all, they took off “layers and layers” of existing paint that had built up over the years, stripping it down to bare metal. For that work, said Leslie, the crew had to suspend 600 feet of 2-inch hose weighing 6,000 to 7,000 pounds across the gut, connected to a large compressor at Sohier Park. The restoration work is not done yet, said Cogger. She is seeking an estimated $80,000 in the fiscal year 2019-20 capital plan to replace the roof of the keeper’s house, to undertake structural repairs to the keeper’s workshop (the smaller white building) and to replace the picket fence. Again, the funds will come from gift shop revenue. As for the Lighting of the Nubble, Leslie donated all the labor for his crew to put up new LED lights outlining all of the buildings. And the workers and Leslie will be the guests on Nov. 26, accorded the place of honor of actually turning on the lights at the end of the countdown. “It speaks to the relationship we’ve formed with him. We’re very pleased with the work he’s done. He has a great passion for this niche of repairing and bringing back these lighthouses,” Cogger said. This annual event for residents and visitors alike kicks off the holiday season in York. Festivities start at 4:30 p.m. on Saturday, Nov. 26, with seasonal carols by Fox and Fern as well as the York High School Chamber Singers. At 5:45 p.m., Santa arrives to bring holiday cheer to children of all ages, and the lights come on at 6 p.m. Free shuttles will be leaving from Ellis Park starting at 3:30 p.m.